Alright, so you clicked through to the full news article so last warning, the whole ending of Far Cry 5 (such as it is) is pretty much spoiled by the mere existence of New Dawn, which makes talking about it and avoiding discussing the aforementioned ending impossible. The "good" ending of Far Cry 5 saw Joseph's prophesy of a "Collapse" come true with the detonation of nuclear weapons (presumably across all America). 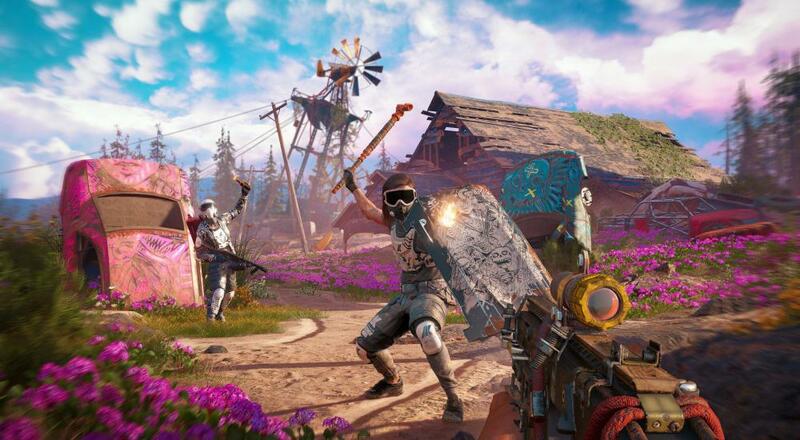 Far Cry: New Dawn is set 17 years after that still within the confines of Hope County. Humanity has started to make its way back and formed into different groups/sects. The Highwaymen, led by twin sisters Mickey and Lou, figure the best way to survive in a post-apocalyptic world is to rob and steal from everyone else. The Survivors, on the other hand, figure it's best to... you know, "survive" and rebuild as best they can. Guess which side you take? Plot setup aside, much of what's shown in the announcement trailer is very reminiscent of Far Cry 5 all with a slight Fallout twist. The weapons all look like they're MacGyvered from some paint cans, paper clips, and rubber bands, you have NPC companions (including a foul-mouthed, narcoleptic grandma and a good, good dog), and there are a variety of animals to hunt/lure into attacking your foes. Basically, if you enjoyed Far Cry 5 and want more of that kind of gameplay, then you might enjoy Far Cry: New Dawn. Far Cry: New Dawn will be out on February 15, 2019 for PC, PlayStation 4, and Xbox One. Two player online co-op will be supported throughout the campaign.